(Nanowerk Spotlight) Acquired resistance against chemotherapy drugs is as old and as widespread as the use of these agents and is a major limitation for the successful treatment of cancer. Different physical stimulations (e.g., electrical, thermal and radiation) can be exploited in order to induce the drug sensitization and to promote chemotherapeutic effects. Here, nanoparticles can act as nanotransducers able to actively respond to external stimuli and convert different forms of energy. There is a large body of work that demonstrates that inorganic nanomaterials are extremely powerful tools in biomedical fields and they have been widely investigated as diagnostic and therapeutic agents for cancer imaging and treatment. The efficacy of nanomaterials in cancer therapy is associated with different strategies allowing for their site-specific targeting (which is key for reducing the adverse side effects of chemotherapy in healthy tissues). Clinical studies have demonstrated that low-intensity alternating electric fields are able to affect the proliferation of cancer cells and potentiate the cytotoxic effects of chemotherapeutic drugs. Key is the ability to deliver the electric stimulation to cancer cells without affecting the function of the surrounding healthy cells. Piezoelectric nanomaterials have shown to be a very promising tool for a wireless, non-invasive, and targeted electric stimulation of cells and tissues. When these nanomaterials undergo mechanical deformation, for instance by being activated through ultrasound, they are able to generate electric potentials on their surface thanks to the direct piezoelectric effect. Researchers in Italy have reported (Scientific Reports, "Ultrasound-Activated Piezoelectric Nanoparticles Inhibit Proliferation of Breast Cancer Cells") an innovative nanotechnological approach for inhibiting the proliferation of breast cancer cells. In this work, for the first time, a wireless treatment based on piezoelectric nanoparticles has been exploited to remotely deliver electric stimulations to breast cancer cells. "We have shown that chronic electric stimulations mediated by piezoelectric nanoparticles result in the ability to significantly reduce the breast cancer cell proliferation by affecting the ion homeostasis and the organization of the mitotic spindles during cell division," Attilio Marino, a postdoctoral fellow at the Italian Institute of Technology (IIT) and the paper's first author, tells Nanowerk. "In order to specifically target the electric stimulation to a particularly aggressive type of breast cancer cells (HER2-positive), we modified the surface of piezoelectric nanoparticles with antibodies that recognize and bind to these cells. This 'wireless' stimulation approach, in principle, would allow perturbing and reducing cancer cell proliferation without affecting the viability of healthy tissues." The team's nanoparticle platform consists of piezoelectric barium titanate nanoparticles coated with antibodies against HER2, a receptor highly expressed on the membranes of HER2-positive cancer cells. This allows the targeted electric therapy to be extremely localized: it facilitates delivering antiproliferative electric stimuli in the proximity of and inside cancer cells. The team's approach, even if specific for HER2-positive breast cancer cells, demonstrates the potential and versatility for the treatment of other types of cancer. Key here is the fact that the physical nature of the electric stimulation leads to bypassing and reducing the acquired drug resistance of the cancer cells. This phenomenon could be exploited to develop efficient anticancer therapies by synergically combining chronic electrical stimulations and treatments with chemotherapeutic agents. "Our approach has been developed and tested on breast cancer cell cultures; next, the targeting ability and the anticancer efficiency of this nanotechnological platform need to be validated also in the 3D environment of the breast cancer," notes Gianni Ciofani of the IIT's Smart Bio-Interfaces group, who led this work. "In particular, we will intensively investigate the accumulation/retention of the nanomaterials at the tumor site. Moreover, we are planning to include the piezoelectric nanoparticles in more complex nanosystems to not only deliver remote electric stimulations to cancer cells, but also to locally release anticancer drugs." Ciofani is a pioneer in the field of piezoelectric nanomaterials for bio-interface applications. Previous publications by his group have demonstrated the benefits of remote cell stimulation mediated by piezoelectric nanoparticles (ACS Nano 2010, 4, 6267; ACS Nano 2015, 9, 7678; Adv. Healthc. Mater. 2016 5, 1808; Nano Today 2017, 14, 9). Out of this body of work grew the idea to apply this innovative stimulation method as anticancer treatment to improve the promising results of electric field treatments and molecularly targeted therapy. This work was developed in the framework of the project Piezoelectric Nanoparticle-Mediated Inhibition of Cell Proliferation: Molecular Mechanisms in Breast Cancer and Therapeutic Implications granted by Fondazione Umberto Veronesi, and carried out at Cofani's Smart Bio-Interfaces lab. While this present work was specific to HER2-positive breast cancer cells, the scientists also are testing the efficacy of their nanoplatform in counteracting the growth of other types of aggressive cancer cells, such as for example, glioblastoma multiforme. In addiction to piezoelectric nanoparticles, the group is adopting other types of nanoparticles, which are able to convert alternating magnetic fields energy or light energy into heat. These nanomaterials can be exploited for magnetothermal or photothermal therapy, respectively. All these nanosystems offer alternative solutions that have the potential to be used in clinical environments in the near future. 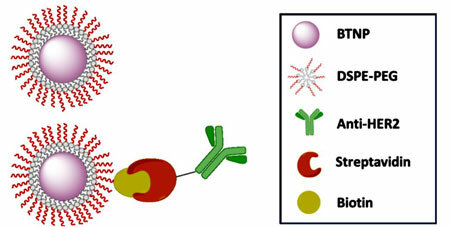 "Although the main application of this work is to inhibit the cancer cell growth, it is worth highlighting that the proposed nanotechnology-based solutions can be adopted not only for the treatment of breast cancer, but also for many different high-impact diseases, especially at central nervous system level," Marino points out. "Indeed, the possibility to remotely deliver electrical stimulations into the brain without the need of implanting electrodes can be extremely useful for the treatment of Parkinson's and Alzheimer's diseases."